University President Lawrence S. Bacow poses for a photo at his inauguration in October 2018. Days before a lawsuit alleging Harvard College’s admissions practices are discriminatory heads to a high-stakes and high-profile trial, University President Lawrence S. Bacow warned Harvard affiliates not to let the suit create rifts between them. Bacow’s message — sent to students and alumni via email Wednesday — marked his first missivedirectly addressing the suit, which is slated to go to trial Oct. 15 in a Boston courthouse. Anti-affirmative action group Students for Fair Admissions brought the lawsuit against Harvard in 2014, during the latter half of former University President Drew G. Faust’s tenure. 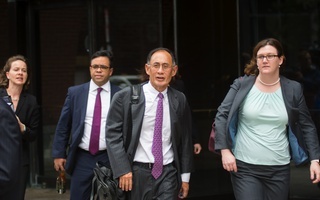 The suit charges that the College's race-conscious admissions policies discriminate against Asian-American applicants — an allegation Harvard has repeatedly denied. In his Tuesday emails, Bacow acknowledged the case has the potential to “create divisions” among University affiliates onand off campus as the trial unfolds. “Reasonable people may have different views, and I respect the diversity of opinion that this case may generate. I would hope all of us recognize, however, that we are members of one community — and will continue to be so long after this trial is in the rearview mirror,” Bacow wrote. Bacow encouraged Harvard affiliates to “approach one another with mutual respect” despite possible differences of opinion. Though students, faculty, and alumni may hold varying views on Harvard’s admissions practices, Bacow’s stance is clear. “Let me be unequivocal: The College’s admissions process does not discriminate against anybody. I am confident the evidence presented at trial will establish that fact,” he wrote. In his first full-length interview with The Crimson last month, Bacow similarly insisted that the College does not discriminate “against anybody” — and that Harvard will prevail in the Boston federal court. 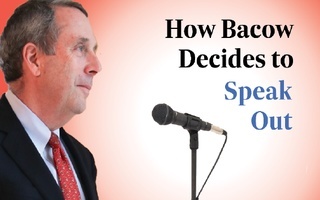 What may unfold if the case reaches the Supreme Court is less certain, Bacow said. Experts have said that, with the recent addition of Justice Brett M. Kavanaugh, the highest court is unlikelyto rule in Harvard’s favor. Bacow said in the September interview that he will refrain from commenting on the trial after it officially launches next week. 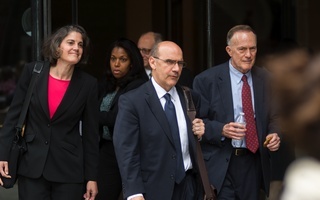 He said it is “important to let the process play out” when thecase is in litigation. Five days in advance of that time, though, Bacow did not mince words. He cautioned students and alumni about what he called the “provocative assertions” SFFA will likely make during litigation that he cautioned would spark increased media attention. He also reassured students that they belong at Harvard. This is not the first time an administrator has directly discussed the lawsuit in an email to students. 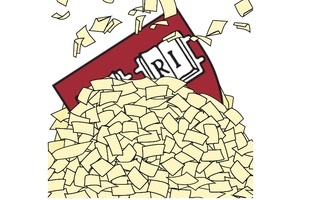 In his August welcome message to students, Dean of the College Rakesh Khurana pointed to a spike in national news reports around the lawsuit following the summer release of documents that revealed previously undisclosed details of Harvard’s notoriously secretive admissions process. The lawsuit has also prompted student groups at Harvard to speak out in defense ofthe College’s admissions policies. The Task Force on Asian and Pacific American Studies has hosted several pro-affirmative action events on campus, including a week-long series of events entitled #DefendDiversity, in the run-up to the trial. TAPAS co-hosted a panel on race-conscious admissions with the Harvard College Democrats on Tuesday that featured alumni speakers who canvassed the history of affirmative action, white supremacy, and strategies for protecting Asian-American applicants without pitting them against other minority groups. Other student groups have refrained from taking stances on the lawsuit, though. In a recent interview, Undergraduate Council President Catherine L. Zhang ’19 and Vice President Nicholas D. Boucher ’19 said theydo not plan to take a public stance on the suit — though some UC representatives said they disagree with that decision.